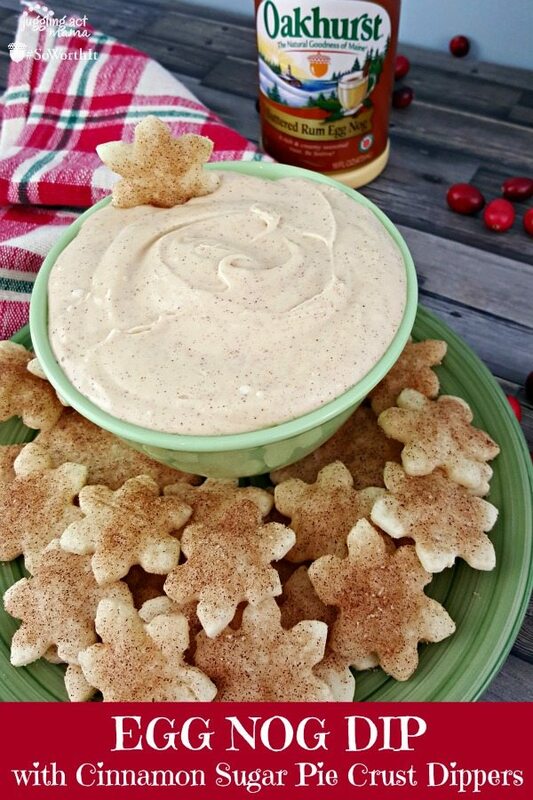 Whip up this Egg Nog Dip with Cinnamon Sugar Pie Crust Dippers for a sweet treat! It’s perfect for making with the kids this holiday season. #ad – Thank you to Oakhurst for sponsoring today’s post. I am an Oakhurst #SoWorthIt Brand Ambassador. As always, all opinions are my own. The holidays are a hectic yet wonderful time of year, aren’t they? It’s a mad rush to get everything done from Thanksgiving to the New Years. It’s a season full of to-do lists, from baking to shopping, parties and pot-lucks. It’s also a season of full hearts, and it’s important to stop and take time to enjoy this busy season long. It’s easy to rush through and miss the simple pleasures of the season. Crisp frosty mornings with freshly fallen snow are sight to behold here in New England, and it’s just one of the many things we need to remember to stop and take in during this busy time. I think that’s what I like so much about decorating the Christmas tree. We stop rushing around and just enjoy it as a family. Yes it’s messy and chaotic sometimes, but the warm memories make it all #SoWorthIt. I love seeing my children’s faces as we take out special ornaments to hang on the tree. Each year, we add one or two new ornaments and their delight is contagious. I’ll hold their smiles and laughter the whole season through. 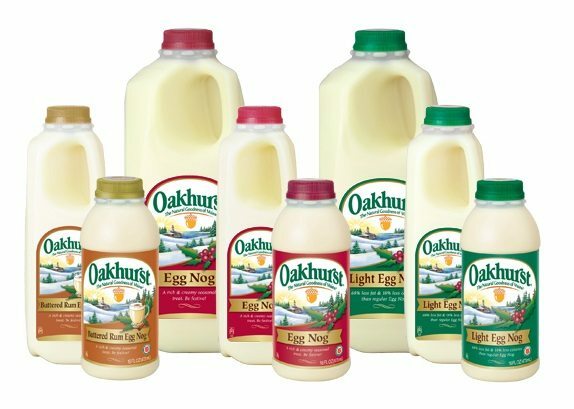 This particular holiday tradition also calls for a special treat like Oakhurst Egg Nog. In our house, it’s a must have for trimming the tree, along with homemade cookies. 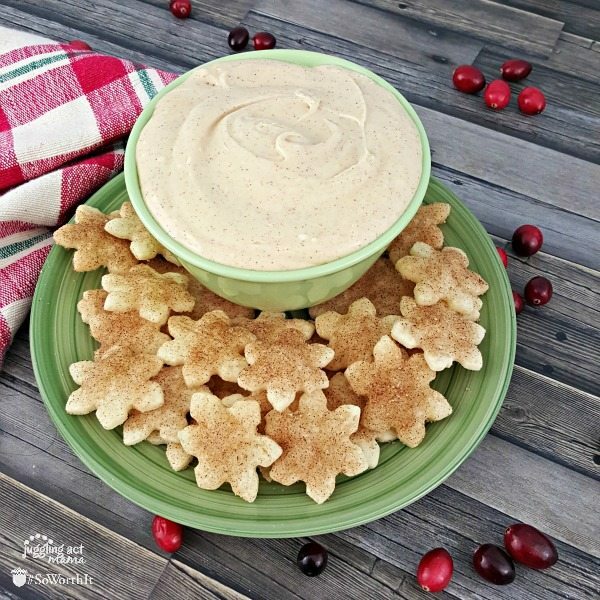 This year, I decided to shake it up a bit and make this creamy rich Egg Nog Dip with Cinnamon Sugar Pie Crust Dippers. It’s a fun new family tradition that I’m sure everyone will love. Whip the softened cream cheese until smooth. Mix in the vanilla extract, cinnamon, and nutmeg. Beat in the Oakhurst Egg Nog – I used the Buttered Rum flavor. Then add in the powdered sugar until the mixture is thickened. Now in a pinch, you could serve this dip with graham crackers or store-bought ginger snap cookies. But if you have the time, these semi-homemade delicious cinnamon sugar dusted pie crust dippers are the best! Line two baking sheets with parchment paper and preheat the oven to 350-degrees F.
In a small bowl, combine the granulated sugar and ground cinnamon. Gently unroll the pie crust on a lightly floured surface. We used both a large and small snowflake cookie cutters to cut the pie crust. Gently transfer the cut outs to the prepared baking sheet. Brush each snowflake with melted butter, then sprinkle on the cinnamon sugar mixture. Bake for 5-8 minutes until golden brown. Let cool before serving. 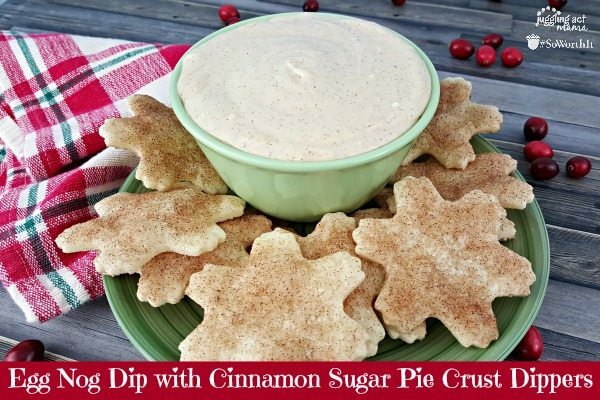 Now just spoon the Egg Nog dip into a bowl, and arrange the cinnamon sugar pie crust dippers all around. This lovely holiday serving bowl and platter would be perfect! Watch the smiles as your family enjoys this fun and festive treat! Disclosure: Please note that this post may affiliate links. Juggling Act Mama earns a few cents should you make a purchase through one of these links, however, it does not impact your cost. See our Disclosure policy for more information. 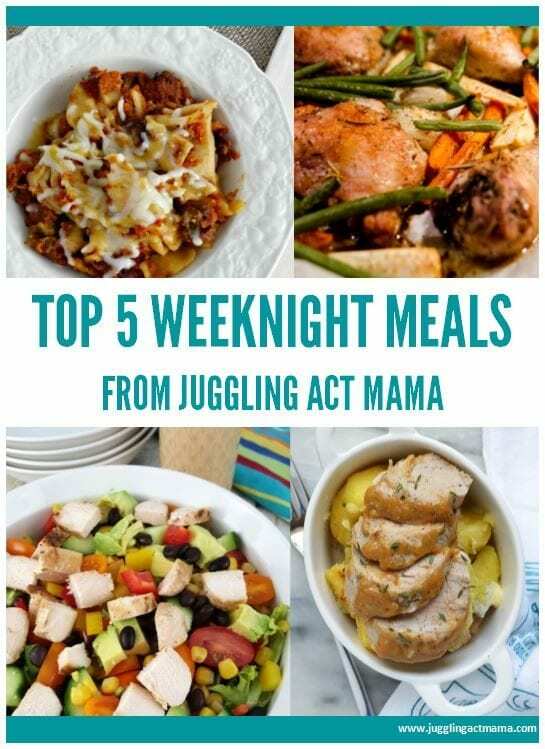 Thank you for supporting Juggling Act Mama. Something other than egg nog dip? Like the idea. Sure you could serve these little pie crust dippers with any sweet dip, or even just homemade whipped cream!